.............'Clifftop’ has not been impacted by the recent Fires in Tathra. Although the fire has burnt areas throughout the town , the town infrastructure, shops etc are still as they were. Houses are beginning to be replaced and residents are pulling together to help those in need. Clifftop was home for 6 months to a single woman who lost everything in the March fire. The house is now available again for future bookings . ‘Clifftop' is a special house situated above the beautiful award winning Tathra Beach. Built in the 1960's the house is quality double brick, retro style. The house and garden is lovingly maintained by us (Chris and Bruce) to make your stay memorable. We have a 7 night minimum stay so you have time to relax, unwind and enjoy our beautiful location. Note:During the summer period only Saturday to Saturday bookings are accepted unless arranged otherwise. 'Clifftop' features high cypress pine ceilings throughout, reverse cycle air conditioning and a loungeroom with spectacular coastal views. It offers easy care living with a well catered kitchen and bathroom with shower and bath. The main bedroom has a queen bed with TV and views to the ocean. The larger bedroom is roomy and private with either a comfortable king bed or unzips to 2 singles. A 5th person can be accommodated if necessary on a divan in the family room (extra person fee applies). All linen is supplied. The casual lounge and dining areas are located in the main living room overlooking the bay. Morning sun streams in during the winter months making this a great warm winter retreat. In summer the sea breezes temper the summer heat making Clifftop a wonderful holiday house all year round. A timber deck at the rear of the house offers views over a private forested gully with established sub tropical landscaped gardens. Relax over a barbeque and watch the sun go down. PETS - A maximum of 2 pets are allowed. They must be clean and well behaved. The house has a small fenced space connected to an enclosed rear balcony. Pets must not be left inside the house when owners are out and simple house rules must be observed inside ( no pets in the bedrooms. No dirty, wet, sandy dogs inside. Feed and water pets outside) Owners must take full responsibility including any destructive damage by pets. Tathra beach is mostly pet friendly (information supplied), with plenty of local walks and parks in the area. Before visiting our area owners should seek advice on appropriate treatment for pets for paralysis ticks. HORSES - If you want to travel with your horse we have a rural property at Kangarutha Cottage near the ‘On the Perch’ Birdpark, where we can accommodate your horse for a small fee. The property has several kilometres of horse trails with access to the Bournda National Park. TARIFF - We ask a 20% deposit for Clifftop on booking and the balance due 1 month prior to your stay. "For your added security, this property is only managed in Australia and we never request payments be made to overseas bank accounts". 'Clifftop' is located right on top of the cliff with unimpeded views. You can almost reach out and touch the sea eagles as they often soar in the updraughts right in front of the house. Whales frequent the bay in season and 'Clifftop' is the dress circle viewing location. The house is very protected from prevailing winds and the northerly aspect adds to the warm ambience. It is only a short 100m stroll to the one of the safest and most beautiful beaches in NSW. Tathra beach is patrolled by lifeguards every weekend from September and every day during the summer to the end of February. A new outdoor gym is available for visitors behind the surf club. A morning swim and workout will ensure the best start to a memorable holiday. Cliff Place is a quiet, peaceful street with no through traffic. Only a short walk of 200m leads you to the famous Tathra Wharf, one of the only old heritage listed shipping wharves on the east coast of Australia. The fishing here is safe and productive with good seasonal catches of trevally, yellow tail, sea bream, mackerel and more. You can simply watch the action if you prefer while enjoying a great cup of coffee or lunch at the wharf ‘Locovor’ cafe. The local butcher, newsagent and supermarket are located right at the top of the street, just a short 150m stroll. Restaurants, clubs and the historic Tathra Hotel are all within a short walk for lunch and dinner, or a courtesy bus is available on request from some venues. Tathra Cellars will soon be rebuilt from a previous building fire and for the 2018 season we recommend BYO to Tathra when you come. We live on property just out of town, adjoining Bournda NP, with tall coastal forest, abundant wildlife, walking trails and private picnic spots. We are very happy for our Clifftop guests to visit us and enjoy our special place. Tathra is surrounded by National parks featuring many coves, beaches, inlets, lakes and rivers. Bournda NP to the south and Mimosa Rocks NP to the north are only a few minutes drive away. They offer safe swimming lagoons and inlets for fishing, kayaking, bushwalking, beach walking and picnics. Many spots are very accessible by car and wildlife is in abundance. Kayak or boat up the beautiful nearby Bega River, and catch a fish or two for the BBQ. Surf the best waves on the coast. Deep sea fishing charters, bicyle hire and tours can be arranged. Golf, tennis, mountain bike tracks, and lawn bowls are close by. 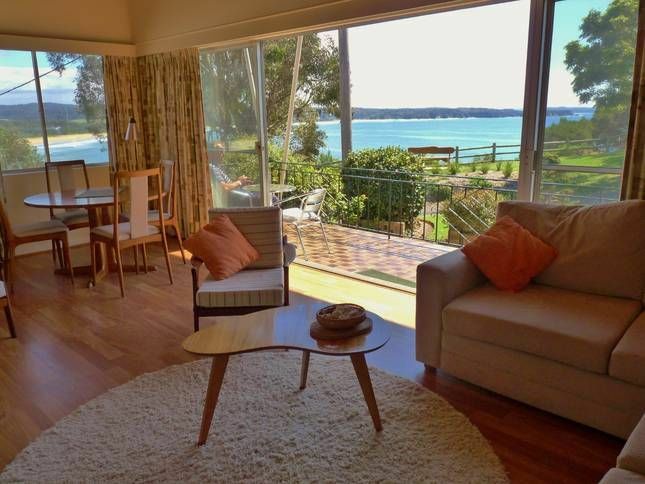 Merimbula is only 20 minute drive away for cinemas, shops and restaurants. Clifftop was built by my parents in 1961. The house is a specially designed Retro home with high timber ceilings and large windows. I grew up in this house and it has a special place in my heart. I inherited the responsibility to look after it in 2008 and do my best to manage it with loving care so that others can enjoy its charms. I am a horticulturist and have restored the sub tropical gully and garden, which is on going. We have lots of wildlife which is a blessing and a burden when it comes to gardens but they do add a great attraction to the property for visitors. Tathra is a special town in a unique location with very friendly people . I live just out of town on another unique property with horses and wildlife. I have the best of both worlds! This was my childhood home and my family will keep it into the future. Clifftop is a unique Retro Home of double brick, high timber ceilings and spectacular views. Every one who visits Clifftop would love to return and most do. The house has a good vibe with easy living and easy care. It is situated very centrally yet quiet , with no through traffic and very friendly next door neighbours. It is only a short stroll to all amenities. Clifftop is only around 100m from the PO, Butcher and Newsagency and also close to the tathra hotel, restaurants, wharf and general store. Clifftop looks out over the bay and the beautiful Tathra Beach with its pristine environment. The beach is only 100m away. Spectacular ocean and coastline views Warm and sunny in winter, cool in summer, looking north. Semi rain forest private garden at the rear. Lots of birds, animals etc. Delightful retro beach house with a spectacular position overlooking Tathra beach. Great views, well equipped kitchen and a charming secret rain forest garden out the back with resident bellbirds. Definitely worth revisiting. So glad you enjoyed our special place. We are always so pleased to host guests who appreciate our efforts with the house. Your well loved dogs are always welcome at Clifftop too. Our aim is for guests to relax, enjoy and return someday to further explore our great coastal town. Clifftop is an amazing place to stay, a brilliant house with outstanding views and proximity to both the pub and the beach. The house itself is almost a time capsule, lovingly furnished and maintained, the owners are also very helpful and accommodating. Thanks for your kind comments Ben. I Love to catchup briefly with my guests, to answer questions about the house and our beautiful area. Being brought up in this house makes it dear to my heart and I love it that others can now enjoy a sense of the 60’s in comfort. We had a perfect stay in this fabulous 50s style house with the most amazing view and the best location in town. The house is spotlessly clean and well equipped. The owner quickly responded to texts and emails, was friendly and went out of her way to make us feel at home. We will definitely stay again. We are so thrilled to receive such a positive review of your stay at clifftop. It makes our efforts so worthwhile. It is always great to meet such a lovely natural couple , interested in our area and wanting to come back. We will look forward to meeting again. We had a wonderful Christmas week at this house. Well equipped and very comfortable. The short walk to the beach and Warf, Pub and Fat Tony’s was also a bonus. We will be back. Thank you Chris and Bruce for the lovely welcome gift. We thoroughly enjoyed our stay at Clifftop. Tathra is such a great beach for families with very friendly, helpful locals. Clifftop has been cozy, with a magnificent view and everything needed for a relaxing stay. We really loved the furniture and decoration theme throughout the house.